Hey campers! This week following christmas, I was determined to clear out the backlog before the new year. 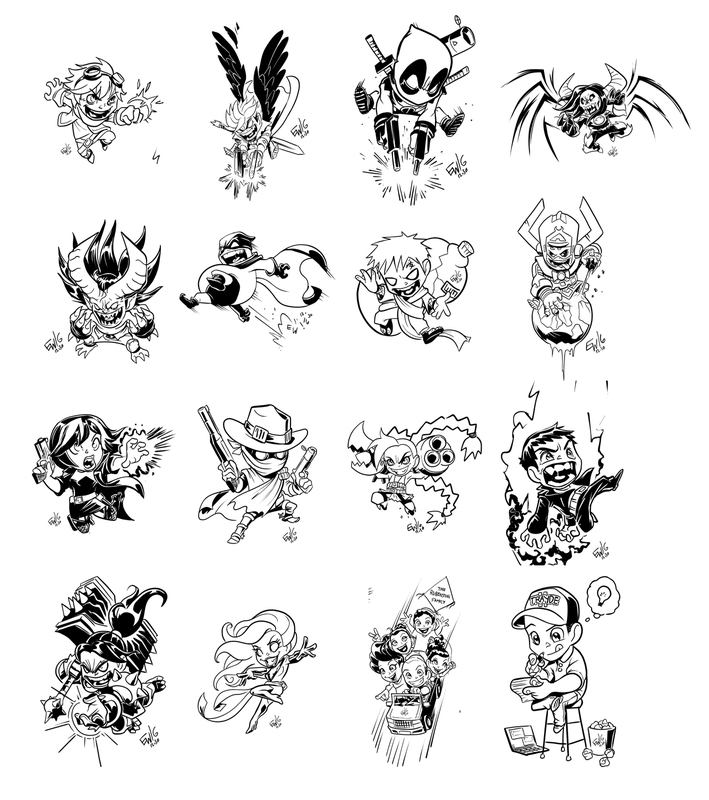 Didn't quite make it, but I did knock out inks on 20 chibis today! They will be sent over to Kristina for flatting and I'll have them shaded/ highlighted very soon! I had 8 to sketch out this morning and then put them with 12 others on a canvas and inked them all afternoon. Was a blast! Just rockin out and slinging inks! Its actually made me re-think my production method/ approach a bit come the new year. Maybe this form of mass production will help me with one of my new year resolutions! These were all done in Inkscape from sketch to finished inks. Will be colored soon! Today is the final day of using !16 for my signature. Here is to 2017 and the new signature :) 2016 was a challenging year full of budding opportunity and personal growth, but there was a lot of crap in it that I could have done without or would like to return to the store so to speak. Heres to a clean slate, a new beginning and a new year! - Get back on a webcomic of my own every week. - Keep up with demand/ work loads! Work those late hours to make it happen! -Take better care of our truck. What are you striving to achieve or improve on in the new year? Have an awesome and safe weekend and new year's eve and see everyone in 2017! 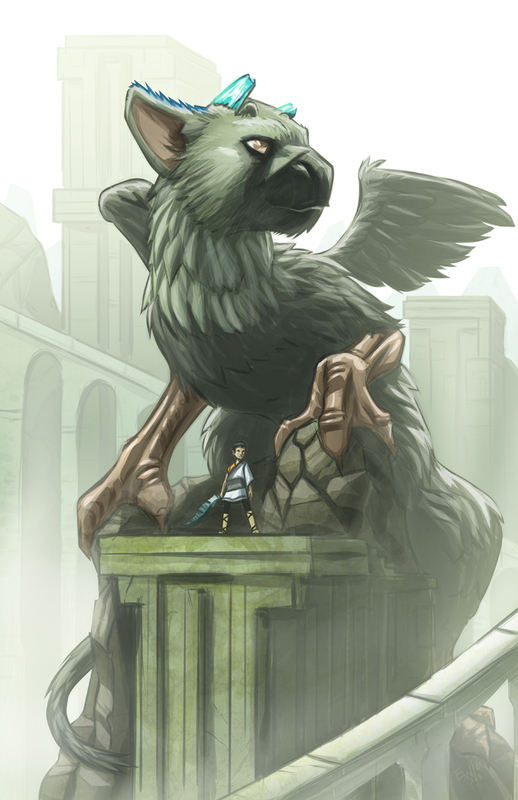 As of this morning, the results are in for the top 10 in the Last Guardian contest and my piece did not make the cut. It is a funny feeling not making the next stage of voting. A clarity and a 'well thats that' kind of feeling. I'm proud of my piece and had a lot of fun working on it. I can see a few things, now looking at everybody elses, that made the pieces moving onto the next round more applicable. More movement, more interaction between the characters more energy. Most more upbeat or at least more emotion one way or another. I didn't realize it before but my piece is very stoic 'batman on a gargoyle' kind of portrayal. I also think I could have adjusted the horns and maybe the snout of the griffin character to be more on-model. Little things like that. All in all it was a fun experience. I really enjoyed the challenge and its satisfying enough on its own to have followed through, finished the piece and submitted it for the contest. I look forward to doing more of these. Speaking of which, I'm hoping to finish an entry for the Megadeth Christmas Card art contest this month in the next week or two so stay tuned for that. I once again believe I have a solid idea, and can put in a good contender. The final 10 contestants are now subject to public voting. I put in my vote for the piece I honestly think is the best out of all 10, and hope ErikPaints wins :) But good luck to all and early congrats to whoever gets picked for the final 3. Lets here it for those who did an amazing job regardless but didn't make it in the top 10 like me. Good game, good game. On this day, seven years ago, I wrapped up my first pencil illustration of HellBoy, a fanart drawing that I attempted to sell on eBay for $10 dollars. 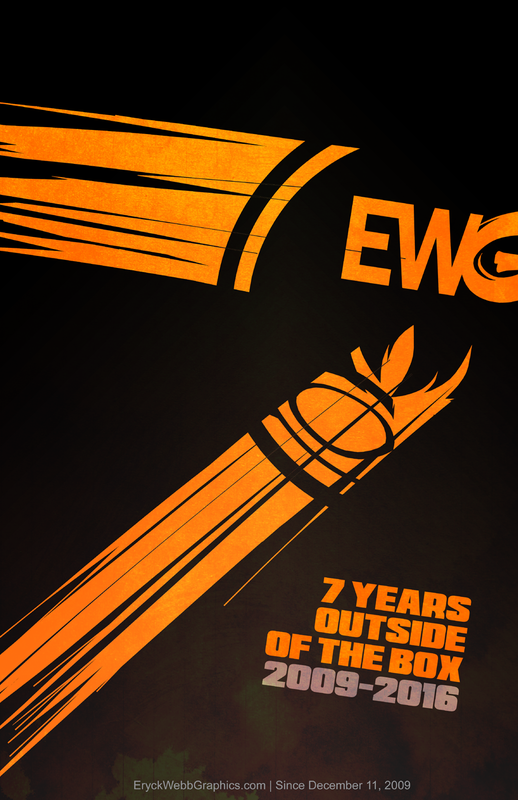 The business model for the then called EWGraphics was simple. Draw 4-5 pencil pieces, whether it be my own original artworks or commissioned pieces, and sell them to customers via eBay. I shipped whatever I sold every Friday. This simple but honest attempt at generating my own work in a climate where nobody wanted to hire led to a brand and body of work that evolved with every year that went by. Now thousands of artworks and seven years have come and gone, and the evolution continues. The first 5 years saw growth and refinement that continues to this day. Read the '5 Year Journey' series for those first 5 years. In this post, I am looking at the last year and the view ahead. While most of 2014-2015 saw me in the role as a comic artist juggling 5-6 different comic gigs at any given time, 2015-2016 saw all but one of those run their course, and me starting the new year with literally no substantial clients on retainer. After much leg work following up with large clients and potential new comic jobs, there was little to no result. I got by with weekly slot commissions to fill gaps in the income and relied on one or two large clients to keep it going week to week. A new direction was needed. It felt like I was back at the very beginning again. I had years of design-heavy work and comic-heavy work and years full of variety. The business was flourishing. Then it felt like I was suddenly back in 2009. Nobody was commissioning me to work no matter who I contacted or how much I advertised. As a wise man once said, "as doors close, so too do new ones open." I had one very important door open in February of 2016 thanks to a friend and colleague over at twitch.tv/2dorkstv. I had been doing late-night sketch streams on Livestream and Picarto to supplement my comic work the year before. I'd do it at night so it would not interfere with the daily grind of the comic assembly lines. 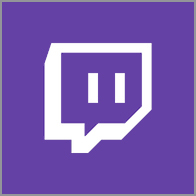 But in February 2016, I was nudged by Steve at 2dorks to checkout twitch and see the many additional benefits it offered compared to services I had been using. My streaming life was changed forever. There was a whole world of creative people to meet and interact with, and I could run my stream with the possibility of donations and other fun interaction abilities with viewers and chatters. After several months of experimenting with the format, soon the Drawing Request Show was born. Almost a year later we have now hit 420 followers, and have gone from streaming two nights a week to every afternoon. Eryck Webb Graphics now makes more from the live streaming commissions ('requests') than from any other source. Customers are able to come out, watch the stream, win free drawings, donate to request commission sketches and even upgrade to finished inked and colored pieces. The latest additions to the stream include drawing-based games for prizes and a drawing-lesson segment where everyone can learn the basics of how Eryck draws. Since October 2016 the workload has been at such a fevered pace that the acceptance of commissions outside of the stream is on a temporary case-by-case basis. The streaming itself has helped bring in commission and design work off stream as well. All in all it has opened up a lot of opportunities I never would have had to meet and be inspired by new artists and work for individuals who I would not have been able to meet otherwise. A year in and I'm still learning as I go. I constantly update and make changes to improve the stream and keep it fresh. As the business moves into a more streaming setup, I look forward to seeing what else is to come. The way this business changes every year, next year I might just be drawing mascots and not even streaming. Who knows? If I've learned anything in these 7 years of working for myself, it is that anything is possible. I'm never done being a student of this creative world and I have absolutely no idea what awaits me and Eryck Webb Graphics down the road! - My wife, Kristina, regularly works for the business doing copy editing and record keeping and has also moved into the world of digital coloring in Photoshop! I am very thrilled and excited to have my wife helping with the creative assembly line! - Drawing Request Show now streams every Monday through Friday at 2 pm Eastern Time! Come out enjoy the show and grab a request! - Opportunities open every week to meet new artists and get inspired in new directions creatively. - The long-time trusty workhorse, Eryck's Wacom Intuos2 finally got replaced this year with an Intuos 5 (Intuos Pro) and its been an outstanding addition to the arsenal! - Twitch inspired the desire to pursue figure sculpting. Eryck has enjoyed exploring sculpting stylized -cartoon figures with Super Sculpy based on techniques learned from fellow twitch streamers broadcasts. He is in the process of finishing his first one as this post is being written. - This year was the first time doing competition-style artwork. Eryck entered a piece in the Last Guardian fanart contest on twitch and will find out if he won on any level later in December! - Eryck Webb Graphics is also going to be represented in the Megadeth Christmas Card art contest as another attempt at a competitive art challenge. - Eryck's interest in traditional artwork remains on the back burner but is always burning. Look for more traditional art pieces to be offered in the year to come. Thanks for reading and here's to another year of unexpected surprises!